April 18, 2017—Boston, Massachusetts—New England Historic Genealogical Society (NEHGS) is offering free access to thirty-two probate-related databases for one week—from Tuesday, April 18, through midnight (EDST) Tuesday, April 25—with registration as a free Guest Member on AmericanAncestors.org. These databases contain some of the earliest probate records of colonial Massachusetts and other New England colonies and states, as well as New York, and New Brunswick, Canada. 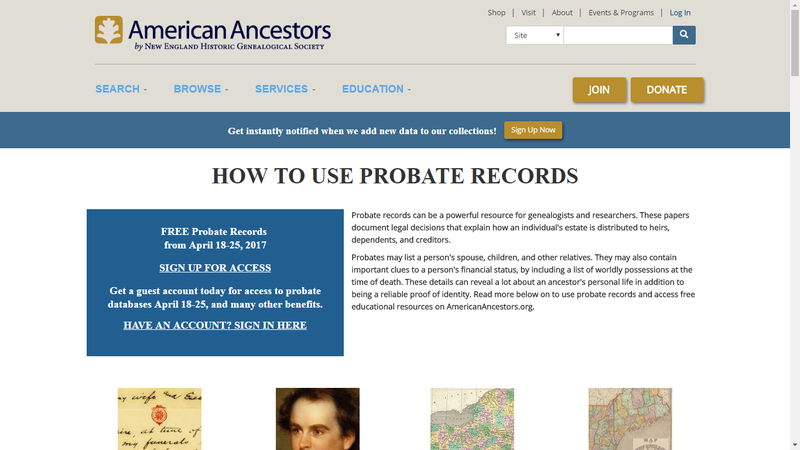 AmericanAncestors.org/probate provides a wide variety of information and features on the use of probate records in family history research, and brings the probate research expertise of NEHGS staff to genealogists of all levels. It is a gateway to a deeper understanding of the use of probate documents in the study of one’s family history. Probate records can be a powerful resource for genealogists and other researchers. These papers document legal decisions that explain how an individual's estate is distributed to heirs, dependents, and creditors. Probates may list a person's spouse, children, and other relatives. They may also contain important clues to a person's financial status, by including a list of worldly possessions at the time of death. These details can reveal a lot about an ancestor's personal life in addition to being a reliable proof of identity and may provide previously unknown information about an ancestor to add to the family tree. Using New England Probate Records, a sixty-minute webinar presented by David Allen Lambert, Chief Genealogist at NEHGS, is available free to all visitors to the site. The webinar offers guidance on how to get the most out of all probate records, with special emphasis on those resources available at the NEHGS library and archives and online at AmericanAncestors.org. New England Historic Genealogical Society (NEHGS) is America’s founding genealogical organization and the most respected name in family history. Established in 1845, it is the nation’s leading resource for family history research. NEHGS provides comprehensive family history services through an expert staff, original scholarship, educational opportunities, world- class research center, and award-winning website, AmericanAncestors.org, to help family historians of all levels explore their past and understand their families’ unique place in history. A member-based, nonprofit institution serving more than 220,000 members, NEHGS is dedicated to advancing the study of family history in America and beyond, by educating, inspiring, and connecting people through our scholarship, collections, and expertise. NEHGS’s resources, expertise, and service are unmatched in the field and its leading staff of onsite and online genealogists includes experts in early American, Irish, English, Scottish, Italian, Atlantic and French Canadian, African American, Native American, Chinese, and Jewish research. AmericanAncestors.org, the most-used genealogical society website in the world, offers more than 1.3 billion searchable family history records spanning twenty-two countries covering the United States, the British Isles, continental Europe, and beyond. The NEHGS library and archive, located at 99-101 Newbury Street in downtown Boston, is home to the largest collection of original family history research materials in the country with more than 28 million items dating from the fourteenth century to the present, including diaries, letters, photographs, books, and microfilm. Disclosure: I have a fully paid NEHGS/AmericanAncestors subscription and have received no monetary considerations from NEHGS.